In an interview with Fareed Zakaria in 1994, Lee Kuan Yew spoke of the notion of a distinct Asian culture and value system, and how this would cause many democracies in Asia to take a different form from their liberal counterparts in the West. Singapore was cited as a living fulfillment of this possibility, a nation that adapted a British political system to its own success using Confucian ethics; namely, a culture that valued “learning and scholarship, hard work and thrift, deferment of present enjoyment for future gain ”. Therefore in Lee’s view, Singapore was not an authoritarian state as many Western observers had criticized; but rather a genuine democracy, albeit one that took on Asian characteristics. With these words, Lee Kuan Yew left behind a legacy that would endure many years afterwards. And so the West, and in particular the U.S., want now to teach us how to run our countries according to their model of Democracy. Beware of their pulling cotton wool over our eyes. Do you seriously believe there is genuine Freedom and practice of Human Rights in America? In short, people like Lee Kuan Yew, Chua Lee Hong, and Ho Cheow Seng subscribe to an “Asian” school of democracy, one that rejects “Western” political constructs like a robust opposition, human rights, free press, and strong civil society. Apart from areas like the economy and popular culture, it is a line of thinking that holds Western ideas in condescension, understood to be incompatible with our Asian way of life. On a theoretical basis, the thesis of an Asian-style democracy may make some sense. However, in light of sweeping political changes that have occurred in Asia, a number of inconsistencies begin to surface. For example, in Malaysia last year, incumbents Barisan Nasional lost ground to the opposition in its worst performance since 1957 , winning the parliamentary election but losing its two-thirds majority. And for the first time in Japan’s history this year, the Democratic Party of Japan overtook the Liberal Democratic Party in elections, ending LDP’s 54 year hegemony . So, while places like Japan and Malaysia have not ended up as carbon copies of Western countries, these countries must have enjoyed some kind of vibrancy in their political climate – a supposed characteristic of Western countries – for these changes to have taken place. Throughout the election we ran a campaign on a slogan called “Government of the People” and we really mean that in a literal sense, that people must be involved in the policy making or decision making process of the government in every step of the way. The government must be the facilitator of society, rather than the dictator of what societies should represent. Applying Lee’s idea of “Asian values” to Bi Khim’s words, it seems that Bi Khim isn’t very Asian at all. Therefore, unless we don’t consider Taiwan part of Asia, any talk of “Asian” or “Confucian” values conflicting with liberal democracy must be dismissed immediately or taken with a heavy pinch of salt at best. Despite this apparent reality, why are so many people still enchanted with the idea of Asian-style democracy? Part of the answer may lie in history. During China’s modernization in the 1930’s, there lived a circle of political elites who welcomed the modernization process, but stressed how the process had to be facilitated using “Chinese characteristics”. Notice the resemblance between this and those who favor Lee’s line of thinking today. [Therefore] by negating the need for political reform in China, these scholars tended to promote resistance to democracy and helped to sustain authoritarian politics. When asked what “Chinese nativeness” meant, these scholars answered that it centered on the “needs of the present”, that is, on the need “to enrich people’s lives”, to “develop the national economy” and to “sustain national survival”. Democracy and political reform was not included in the “needs of the present”. Note an important distinction here. Keping is not suggesting that “Chinese characteristics” or “Chinese conditions” do not exist. Rather, he rightly points out that within the cultural and anthropological argument – that is, any line of thinking that emphasized such terms in its reasoning –is room for exploitation. 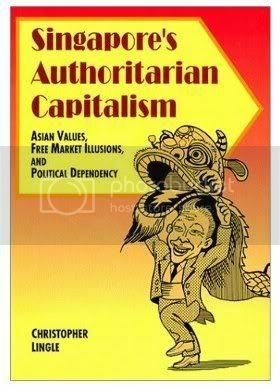 Likewise, whenever terms like “Asian values” mentioned today, we should exercise such discernment: is there real value behind what’s being said, or is it just lofty rhetoric used to further a political agenda? The second problem with the cultural argument is that it overlooks one huge reality – the fact that a society’s values are constantly changing. The 21st Century has been hailed by many as the age of change with the forces of globalization constantly shaping our culture and belief systems. With this in mind, how relevant are paradigms like “East vs. West” in a fast-changing globalized world? This is compounded by the fact that Singapore, ranked the 7th most globalized city in the world in a recent survey, tends to be more exposed to these forces of change. A third problem is the influx of foreigners into Singapore over the last decade, resulting in a dramatic change in our social fabric. A recent population census highlighted that of the 5,000,000 or so people living Singapore today, only 64% are actual citizens, down from 73% in 2000 and 86% in 1990 . With foreigners now comprising one-third of our population, who determines our identity, culture and values as a nation? Surely, in answering this question, one cannot ignore the influence of these 1.8 million people living here, even if they lack the political rights of citizenry. In final analysis, we see that any approach towards democracy using a cultural framework quickly disintegrates, running into many inconsistencies and problems. Instead, a correct framework should be one that first determines a set of universal themes and ideas, or “democratic non-negotiables” if you like, and then examines how these ideas can be applied to society. Therefore, rather than asking the question: “What are Singaporean values, and how does that apply to a democracy?” we should be asking ourselves: “What is a democracy, and how does that apply to Singapore values”? Though the answer will still have a distinctly Singaporean paradigm, this shift in thinking will result in a democracy more authentic and meaningful for its citizens. In refusing Western prescriptions, Asians were perceived to be promoting the superiority of their own values. In fact, they were merely arguing that they would be free to choose their own political paths. Lest there be any misunderstanding, Asian intellectuals – including those from China – argue that the ultimate destination of all societies is democracy. The destination is not in question, only the route and the timing are.